This week poor Sprouty got his one-year shots. This involved four separate needles into his little arms. He was definitely much more upset this time than the previous immunizations at two, four & six months. After a minute or so, his heart-wrenching little sobs quieted after breastfeeding. I hope he wasn't traumatized enough that it will make him fearful for his 18-month shots. The good news is, at his weigh-in before the vaccinations, he was 21 pounds 3 ounces, which puts him up a little in the percentiles. He hasn't grown much in height over the last few months, though, so he's still about 30 inches tall. Last weekend we also travelled to the Okanagan to visit Oma & Opa. Little L put up with being passed from one octogenarian grandma to the next at Oma's 80th birthday party & didn't have his overstimulation meltdown until the ride home. Ugh. Five hours of crying/screeching with intermittent short naps. The trip up there wasn't so bad--we kept him from napping until we left at about 3pm. Then we drove straight through to Merritt to try & get as many kilometres in as we could before he woke up. He slept two & a half hours & was fairly happy to play with some toys & 'read' books for the next hour & a half. He was pretty ready to get out of his car seat by the time we were nearing Winfield. Favourite toys this week: his plastic baby cutlery (holds it in his hands & crawls around with it (click-slap-shuffle-shuffle, click-slap-shuffle-shuffle) & the cat's water dish. Apparently splashing his hands in there is the most fun thing in the world. His attention span continues to amaze us. 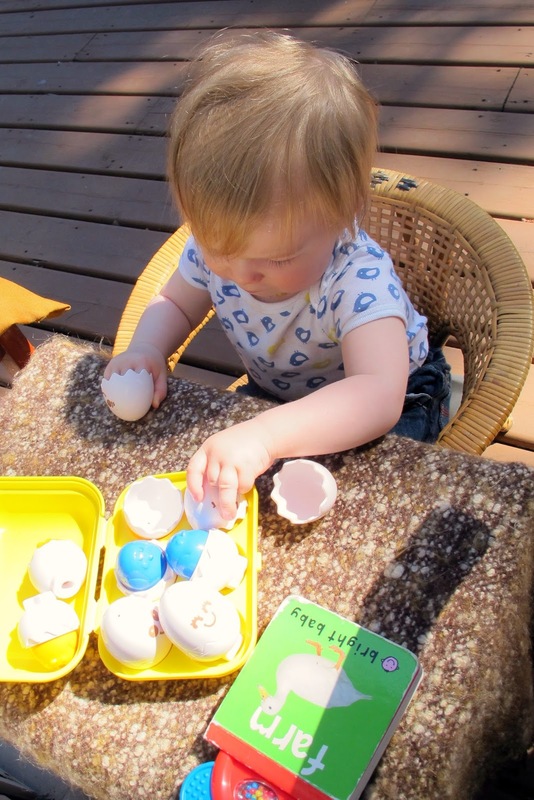 At his Oma &amp;amp; Opa's house, he sat in a tiny little rattan armchair, pulled up to a 'desk' & played on his own with his toys for over 15 minutes straight. 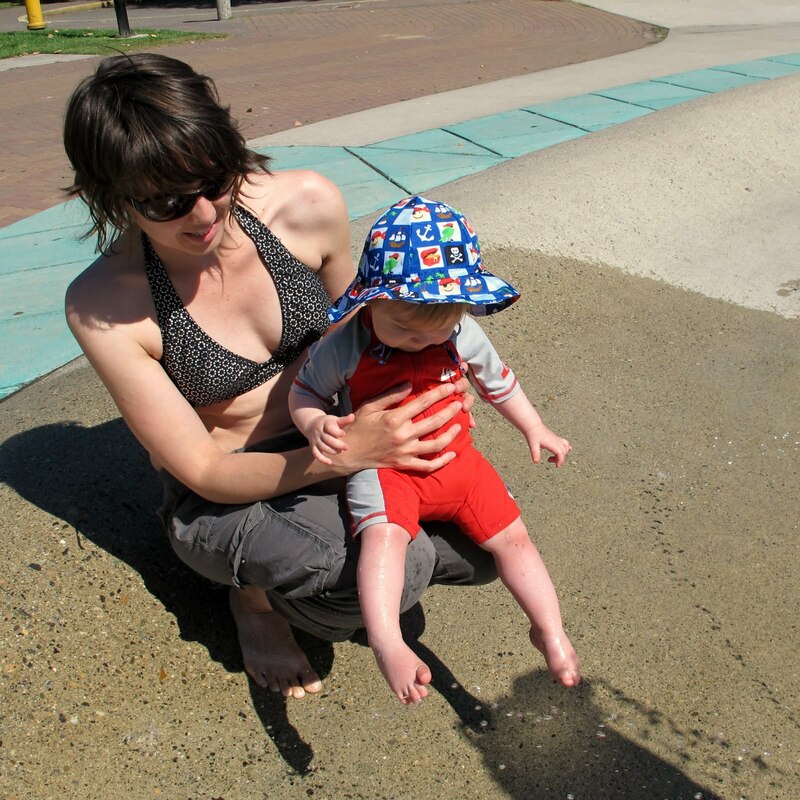 Another first was his trip to the water park in Kelowna. He was not that impressed by the water slide (guess it wasn't steep enough for dangerbaby) & didn't really like the cold water in all the spraying, dumping & shooting things. Playing in his 'pool' (a plastic under bed storage bin) at home went over much better because it was filled with warm water. He's also discovered how to make a funny burbling sound by vocalizing & playing with his lips. Hell do that for a while, then switch to making clicking noises with his tongue. He is babbling quite a bit--he will occasionally interrupt our conversations by shouting "Buh buh buh dit dit dit! ", or "Yah!" & various other sounds. No obvious words, yet, although I think he is using 'dah' as a sort of demonstrative like 'that' when he's interested in something. Though he's not really talking yet, Sprout is becoming much more communicative. He uses more gestures now, like lifting his arms to be picked up, pointing at things & waving. He understands a few words, like kitty, banana & water.